In collaboration with the Danish Cultural Institute and partners around the world CO2 Green Drive is being prepared for Earth Day 20-22 April 2013. CO2 Green Drive is an Art, Climate & Technology Project designed to promote climate awareness using art and culture as universal vehicles. Since the inauguration of the project in 2009 CO2 Green Drive has been performed 25 times in 21 cities on five continents. On Earth Day 20-22 April 2012 CO2 Green Drive was performed with electric and hybrid vehicles in New York, bicycles and skaters in Dakar, electric vehicles and bicycles in Santiago and Denmark, and runners in Delhi, Bangalore, Pune, Thane, Hyderabad, Bhopal and Yokohama. CO2 Green Drive involves creating GPS based “paintings” using climate friendly transportation solutions as “brushes”, smarthone technology as “paint” and cities around the world as “canvases”. Anyone using climate friendly means of transportation is welcome in CO2 Green Drive, eg. runners, bicyclists, pedestrians, soap box cars, stiltwalkers, electric, hybrid, bioethanol and hydrogen vehicles etc. Get more information on how to participate in CO2 Green Drive on Earth Day 2013 on the CO2 Green Drive on Earth Day facebookpage. -Promote healthy, sustainable and playful social dynamics through the combination of participation, art, climate and technology. – Expose climate related products, activities and services while engaging a committed, global audience. – Provide an experimental platform for all stakeholders to interact with fellow citizens, public institutions, civil organizations, businesses, academics and artists. To celebrate Earth Day 2012 Burt’s Bees asked Diego Stocco to create a video performance in the style of my Music from a Tree. To expand the concept he also included as “instruments” some of the ingredients used in their products, like honey, almonds, rice, and coconuts; also bees had a musical role in this piece. He performed the whole composition by playing these natural elements, no synthesizers, samplers or additional sounds have been used. The Roanoke College Performing Arts Series Presents the Artichoke Dance Company with “The Plastic People of the Universe” ~Earth Day 2012~ April 22, 2012~ 3:00pm Individualistic movement vocabulary, poignant dialogue, whimsical video, innovative set and costume design, and satire mesh to address the nature, exponential growth of, and effects associated with polyethylene, the most common plastic in use today. Investigating the exponential growth of single use plastics, and the repercussions that plastics are being discovered to have on the environment and in the human body, Plastic People of the Universe features dance, film, text and design to create a world propelled by cycles of creation and destruction. Upcycled plastic six-pack holders collected from New York pizzarias serve as the base element for the costumes and set. To be added to our mailing list for future show announcements, please visit www.roanoke.edu/fineartslist. via Roanoke College – Roanoke College Web Calendar. Textile artist Cybele Moon: "I wanted to share my love of color with others." Artist Cybele Moon partnered with The Trailer Trash Project to offer her Earth Day art installation to the community of Santa Clarita, CA. Some artists choose paint as their medium. Others choose stone or metal. Cybele Moon chose fabric–or perhaps it chose her. “My mother used to weave and make her own clothes. One of my grandmothers worked in a bobbin factory, and she sewed at home. My other grandmother would crochet and do cross-stitch,” explained the Cal Arts grad student who was a professional costume designer before deciding to go back to school to get an MFA. Cybele spends most of her time at Cal Arts working behind the scenes, designing costumes for dance and theatrical productions. 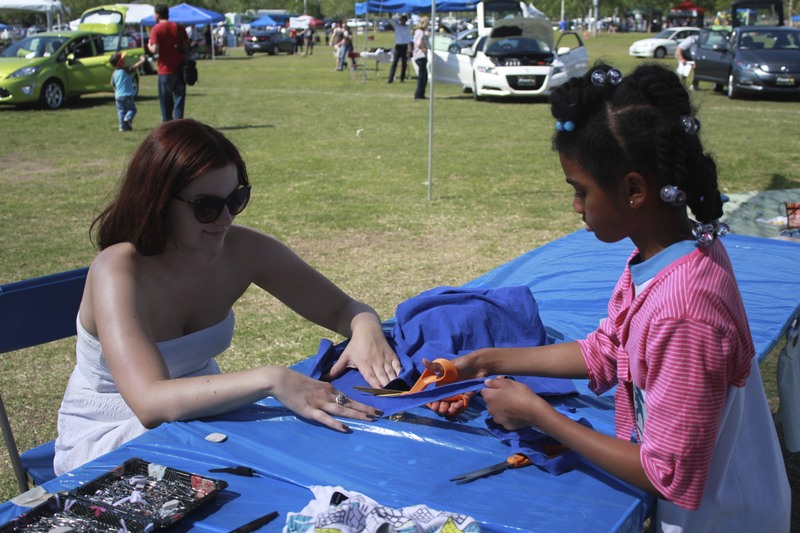 Before graduating she wanted to create some of her own textile art and share it with the Santa Clarita community on Earth Day. Sam Breen's 1951 Spartan trailer provided a backdrop for Cybele's installation. The result: a textile installation resembling dripping vines, dyed in the soft blue and green colors of spring. The work was fashioned from recycled T-shirts donated by CalArts students, faculty and staff. Drawing on her skills as a costume designer Cybele, along with Jessica Ramsey and Emily Moran, two Cal Arts BFA students in costume design, conducted a workshop for kids demonstrating how to transform used T-shirts into trendy scarves, vests, tank tops and other items of clothing. With graduation coming up, Cybele’s thoughts have turned to the future. Her dream? To live some place where she can have a huge garden and chickens. Her career goal is to be costume design professor and to continue working professionally as a costume designer. She will also continue to explore her own textile art. Cal Arts students Cybele Moon (r) and Jessica Ramsey (l) conducted a workshop for kids to show how to turn a used T-shirt into something unexpected. 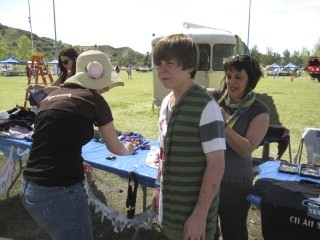 The experience on Earth Day in Santa Clarita has inspired her to try to take on more collaborative community projects in the future, especially those geared for children. Her off-campus art project comes at a time when she and other Cal Arts students are working at a hectic pace, trying to finish up the school year. Emily Moran (l) helps a youngster work magic with recycled clothing. 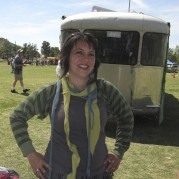 Sam’s vintage trailer provided a framework for Cybele’s piece, giving the trailer’s metal exterior a soft, whimsical look. It could be the beginning of a colorful, art-inspired and Earth-friendly spring. For more on Cybele Moon, click here for her web site. The vision of climate change provided by the arts complements the analytical information given by the science. The landscape of numbers can be populated by dreams in the form of images, dance or music, leading to a more complete understanding of how our planet works. Join The Earth Institute, Columbia University; the Segal Center; and artists, scientists, and communication experts working across multiple disciplines in an inspirational, informative program to explore present and future connections between the arts and climate change science. In honor of Earth Day. 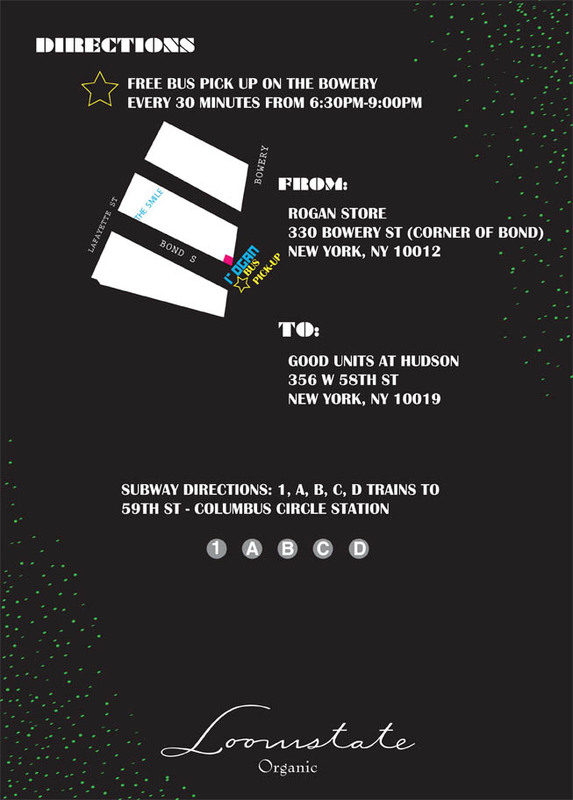 Co-curated by Lisa Phillips. Martin E. Segal Theatre. Free! Moderated by Sabine Marx, Center for Research on Environmental Decisions, Columbia University. Earth is at a critical crossroads. While revolutionary advances in science and technology have lifted humanity to new heights of prosperity and longevity in many parts of the world, hundreds of millions of people are vulnerable to the impacts of hazards and natural disasters, extreme poverty, infectious disease and a host of other challenges. At the same time, human activity, especially in the last 100 years, is threatening the health of the environment and potentially posing risks of unprecedented magnitude to our shared future. The Earth Institute, Columbia University is the world’s leading academic center addressing the challenges of sustainable development. 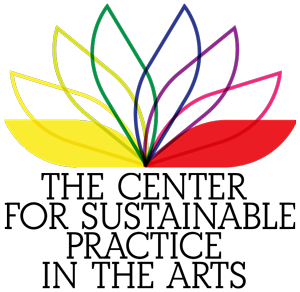 Our mission is to mobilize the sciences, education and public policy to achieve a sustainable Earth. The Earth Institute’s overarching goal is to help achieve sustainable development primarily by expanding the world’s understanding of Earth as one integrated system. We work toward this goal through scientific research, education and the practical application of research for solving real-world challenges. With 850 scientists, postdoctoral fellows, staff and students working in and across more than 30 Columbia University research centers, the Earth Institute is helping to advance nine interconnected global issues: climate and society, water, energy, poverty, ecosystems, public health, food and nutrition, hazards and urbanization. With Columbia University as its foundation, the Earth Institute draws upon the scientific rigor, technological innovation and academic leadership for which the University is known. 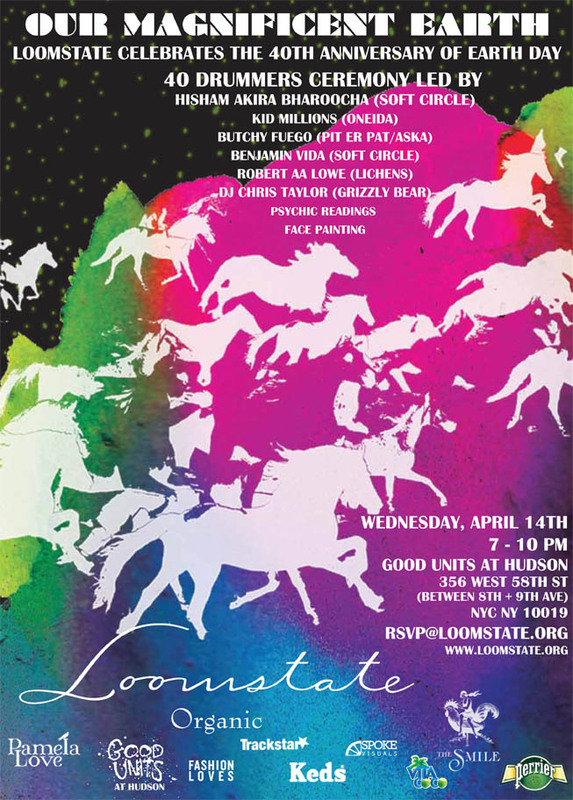 FRIENDS OF LOOMSTATE: PAMELA LOVE, GOOD UNITS AT HUDSON, KEDS, PERRIER, VITA COCO, FASHION LOVES, TRACKSTAR, SPOKE VISUALS, and THE SMILE. Nudge, Nudge, Wink, Wink – there needs to be more promiscuity across different disciplines if there’s to be more fruitful solutions to environmental change. On Earth Day, Seed magazine published a well-toned article about economist Ben Ho, and suggested a need for joined-up thinking on climate change between behavioral economics (hence the reference to ‘Nudge’) and social sciences (erm… ‘winking’ is anthropological). And these latest understandings from the sciences about human behaviour bring big questions into focus for art practioners. Do the arts understate their potential role in generating a more holistic understanding of contemporary life? And what are our expectations of art? What kind of insights do artists bring about in relation to social change and environmental change…? (The most talked about art book on this is Bradley and Esche’s ‘Art and Social Change’, which is worth reading in conjunction with Mute magazine’s in-depth discussion). 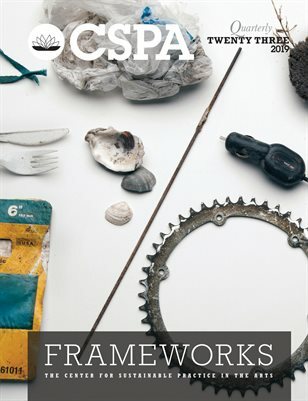 And this is surely the way forward for the arts too – art benefits hugely from engaging with other disciplines and there is real need for productive honest progressive debate about the ‘use’ of the art in relation to contemporary environmental change, without returning to the entrenched positions of instrumentalism v art for arts sake. Isn’t it the case that speaking provocatively about personal ethics and politics enhances our understanding of artists’ work? This is the first time since back in November/December that we have not posted anything for a couple weeks! I think both Amy and I are taking a spring time break . . . . Wanted to submit a quick post to let our blog followers know that we have updated our projects page on the ecoartspace website! We realize that the more active we are with the blog, that our website becomes less relevant. So, it is now up to speed. This is an ongoing issue and why we really enjoyed having the blog (as we rely on someone else to update the website). O’yes NEWSFLASH: our ecoartspace Facebook group reached 1,000 today!!! And, we have added a fan page as well and are posting links daily, like a Twitter feed. Plus, we are also on Twitter. So, if you want quick byte size morsels of information/links, sign up to follow ecoartspace through our fan page on Facebook or follow us on Twitter! Amy will be posting soon on a recent panel she participated on in upstate New York with Jason Middlebrook and I plan to write up a summary of the Rising Tides conference I attend last week here in the Bay Area next. There really is an overwhelming amount of activity right now in the world of art and ecology. It has been an exciting Earth Day week. …like thousands of gallons of paint, enough to cover 2.8 acres of roof! Um, am I just a hater? Anyway, so glad Earth Day is over for this year. > Another good article on the Wyland mural here. 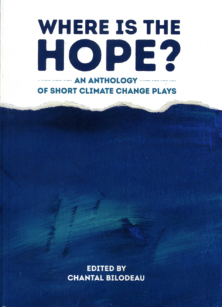 Join us on the evening after Earth Day to explore what theatre artists and production staff are doing to meet the extraordinary challenges of climate change. At a time when local, state and federal governments are setting goals for reductions in carbon emissions, holding public meetings to solicit public recommendations for adapting to rising sea levels; when businesses are beginning to talk about renewable energy, closed-loop waste streams, and innovative mobility systems; what are we doing in the theatre? via Theatre and the Environment « Mo`olelo Blog.